I thought it might be a good time to do a wrap up of the first half of the year for me. This has been my third year of being a full-time artist, and my first year of leaving the weekly markets, working on competitions and building up my new collection of work. Thank you for following along my journey on Instagram and Facebook. I love hearing feedback, comments and suggestions from you - it feels like I'm building a real community and it's all thanks to you. If you've never left a comment, don't be shy! Even if it's a photo of your pet or a comment on what you're up to, I'd love to hear it. This year has been wonderful for me so far - I hope it's been a good one for you too! I moved into a new apartment with my partner that has an entire room for my studio! How lucky am I? It's glorious and filled with sunlight and a beautiful breeze; with plenty of room for dozens of paint splattered canvases and cheery plants. I even get to spy on the neighbours dog from here (it's very cute!) I've covered a few topics below and sectioned them off so you can skip over anything you're not interested in. Thanks for having a read and have a great day! 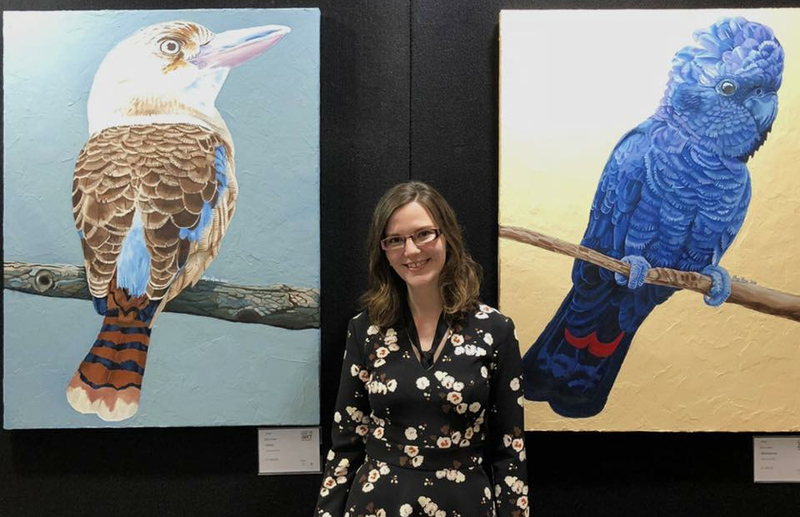 So far this year I've been a finalist in the Morris Art Prize in the Gold Coast, the Rotary Art Spectacular in Brisbane (huge accomplishment for me! ), the Border Art Prize in Murwillumbah, and have just heard the news of Brisbane's Lethbridge Gallery 10000 competition - which will be on display from the 12th of July. Each of these achievements has given me a real boost in confidence that my work is good enough to move beyond a local market and into galleries. I hope to continue being accepted into these events and hopefully meeting some new fans who join our little community here! I'm putting my previous series of watercolour animals for sale late July or August, when I receive my wombat painting back from the Border Art Prize where it's currently hung for the public. This little painting is the reason I've managed to become an artist. I had no idea of the magic I injected into the painting when I made it, but the money I've made from prints allowed me to run my stall, build up my inventory, try new products (tote bags! ), and enter into the expensive world of oil painting. And I'm SO GRATEFUL. As the hero piece of my collection, it is more expensive and I'll be giving a portion of the profits to an animal charity when she does sell. My other pieces will be framed and available too - if you're wondering, that includes my elephants, lion, giraffes, fox, koalas (pictured), kookaburras, horses (pictured) and butterflies. My trio of blue birds and rainbow lorikeet originals have already sold, to people so insistent that they went before they were even put on sale! I can't guarantee it won't happen again, so let me know if you're interested in any of these pieces before they're snaffled up. I'm sad to see them go, but if you saw the state of my studio, you'll know I need to make more space for upcoming paintings for you! Enjoy the segue I did there? If you're following me online (and if you're not, you definitely should be!) you'll have seen lots of progress photos and behind the scenes shots of what I've been working on. You'll also notice how much time and detail goes into every piece. Art comes together slowly. It takes time, patience and love for the craft. I've been so inspired this year by the world around me that I have a few series of paintings on the go at once. It's a bit of a race to see what is finished first! I have a series of paintings of Murwillumbah, my home town and the most beautiful place on the planet. I am down there often and have so many reference photos to choose from. The colour schemes are natural and beautiful, lots of soft muted greens, purples and blues. Perfect for creating serenity in the bedroom, or as a talking point above your lounge. My third series is of the homes and lifestyle of Brisbane. I am constantly inspired by the beautiful houses and peace and quiet I find in the streets of Brisbane. Sometimes you can catch me lurking around with my camera, taking photos of glorious gardens, picket fences, and Queenslanders. One of these pieces will be in the Lethbridge 10000 exhibition on the 12th of July. This series started out in a wild frenzy, but has calmed down into choosing my favourites and honing in on them. Each piece reflects the stillness of the suburbs, the birds in the trees, the children learning to ride their bike. I hope you love it as much as I do. Watercolour and Wine has been making a splash too. 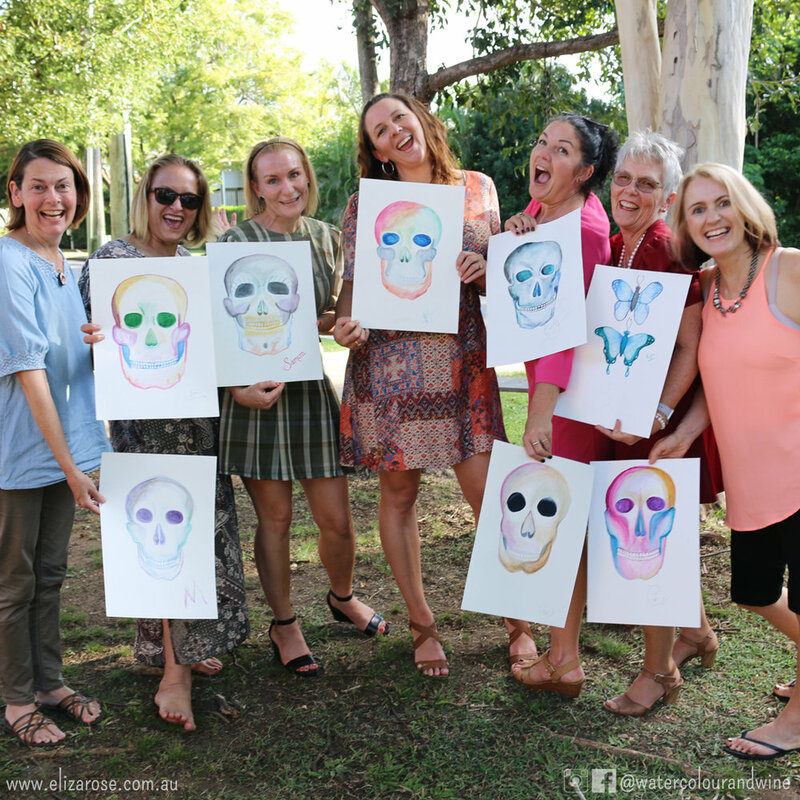 I love running this paint and sip because not only does it support me while I'm working on my new series of paintings, but I also have so much fun that I'm always buzzing afterwards from meeting such great people! I've done a little rejig of how I run it this year, and I'm doing a handful of public sessions and bringing the focus more towards private parties at your venue. This makes it more convenient and affordable for both of us, as well as more intimate (because what's more fun than a backyard painting sesh?) The price for public sessions at a hall is still $55 per person, but at your venue is now only $40 per person - so there's no better time to get in touch to plan your next birthday party, hen's party, or work event. I've been thinking about running a painting party for parents and kids as well, as I've been asked a bit - let me know if that's something you're interested in and want to plan your child's next birthday party with me. Sounds like a perfect way to get kids creative and have a mum's day out together. As always, I'd love to hear your opinions or thoughts on any of the above. Congratulations if you made it all the way to the end and apologies this ended up so long! It's been a busy year. I love reading your emails back and hearing what you have to say. What would you like to see from me? Do you have a gorgeous Brisbane home that you think I'd like to paint? Do you have a pet bird that is destined to join my series? Do you have any ideas for this blog? Let me know! Here's to a great second half of the year for us!